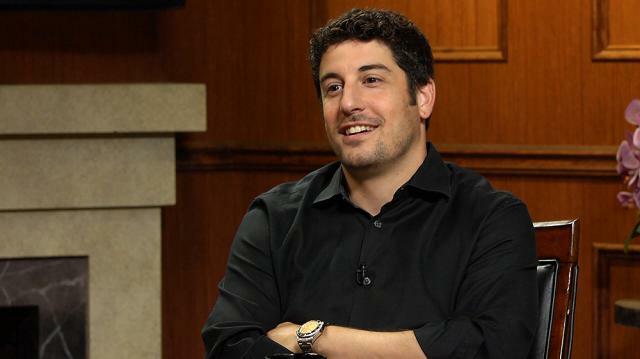 How does Jason Biggs like being known as the "pie guy"? The actor is refreshingly candid while discussing with Larry King the legacy of that infamous scene from the original ‘American Pie’ movie. King: Are you sick of talking about the scene with you and the pie? Biggs: Can I be honest with you? King: Please. Biggs: I am so thrilled to be here right now talking with you Larry about the pie scene. I've talked about it for almost 20 years, I've talked about it in every which way. King: I've never seen it. King: Absolutely true. Why would I lie? Biggs: My wife hadn't seen it when we met. And actually didn't see it until aboutsix or seven years into our relationship. King: So why are you particularly thrilled about talking to me about it? Biggs: Because I'm a huge fan of yours. King: Oh. Biggs: Huge fan of yours. King: Alright. Biggs: I have been for many, many years Larry. King: I'm thrilled. Biggs: And I'm thrilled to be here. I just made a post on my social media about this being a bucket list for me. It's true. King: In the scene you make love to a pie? Biggs: Yes, thank you. *Laughs* This is awesome. King: It's followed you yourentire career. King: When they proposed it, how did you react? seventies, and then kind of there was a new resurgence of these films like 15-20 years later and I was auditioning for every single one of them. I was new to LA, I read them all, auditioned for them all, would have been thrilled to get any of them, was happy to get a callback for any of them, would have happily taken any, there was no choosing. King: I get it, of course.